Gayler, Hugh J. and John N. Jackson. "Niagara Falls". The Canadian Encyclopedia, 11 March 2019, Historica Canada. https://www.thecanadianencyclopedia.ca/en/article/niagara-falls-ont. Accessed 20 April 2019. Niagara Falls, Ontario, incorporated as a city in 1904, population 88,071 (2016 c), 82,997 (2011 c). 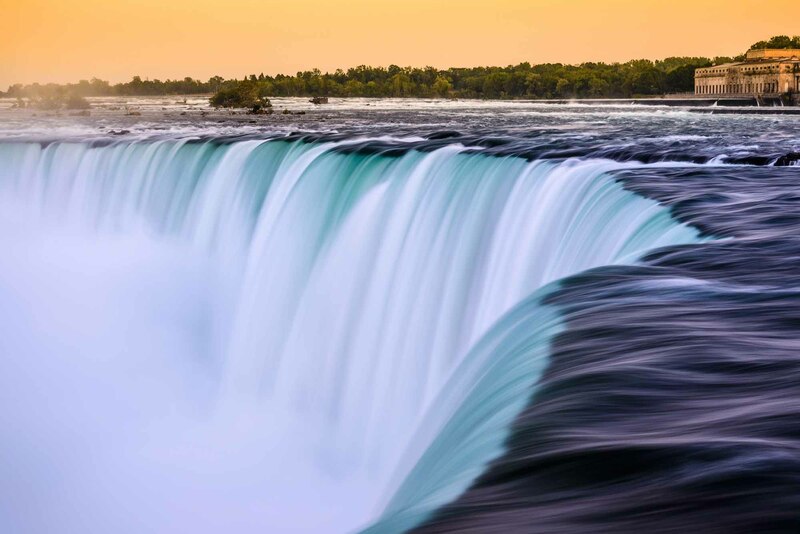 The City of Niagara Falls possesses a fame and name that are based on the stunning, world-famous Niagara Falls on the Niagara River. Growth has combined tourism and gambling with railhead developments at this Canadian–US border crossing. In the past the manufacturing industry (including electrochemicals and abrasives) dominated, fuelled by cheap and readily available hydroelectric power. Prior to the arrival of Europeans, the Iroquoian-speaking Neutral lived in the region that now includes Niagara Falls, between the Grand and Niagara rivers. They were called Neutral by the French, who observed that the tribe remained neutral in most conflicts between the Wendat (Huron) and the Haudenosaunee Confederacy (also known as the Iroquois). In addition to hunting and fishing, the Neutral grew squash, beans and corn; and their villages included longhouses. In 1647, several Neutral villages were conquered by the Seneca from the east side of the Niagara River. Later, in the early 1650s, additional villages were destroyed by the Haudenosaunee. These attacks, combined with the smallpox epidemics of 1638–40, meant the Neutral population largely ceased to exist. They were last mentioned in the writing of French explorers in 1671. The Haudenosaunee, however, continued to live in the region as the French, British and Americans fought for control. Today, many Haudenosaunee remain in the Niagara Falls area, both on reserve (the Six Nations reserve lies to the west of the city) and in other communities. The first European explorers in the Niagara Peninsula were the French who came from the St. Lawrence Valley via Lake Ontario	early in the 17th century. They engaged in the fur trade and missionary work as far west as Detroit and south towards the Ohio River, establishing a portage route around Niagara Falls to connect Lake Ontario and Lake Erie. In 1679 the French built stockade at the future location of Fort Niagara, calling it Fort Conti. 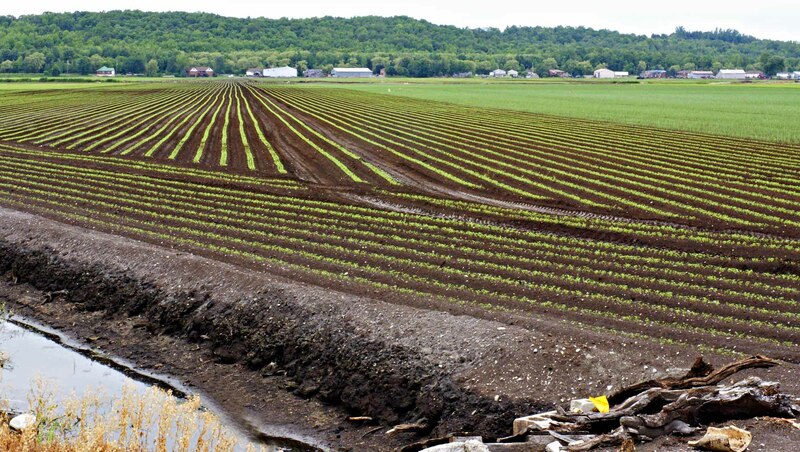 This was followed by the first permanent settlement on the east bank of the Niagara River. The location was related to the need to defend their trade interests around the Great Lakes	from the expansion of the American colonies. The capture of Fort Niagara by the British in 1759 and the defeat of the French elsewhere in Canada led to a British settlement west of the Niagara River and later elsewhere in southern Ontario. Treaties with the Senecas in 1764 and the Mississauga in 1781 secured land for agricultural settlement to the west of the river. This was an important food supply line for the British military during the American Revolutionary War. After the war ended, a border between the United States and what would become Ontario was established down the middle of the Niagara River in 1783. The War of 1812 — fought between America and Britain, and by extension, British colonies — played out in the Niagara region. The war was destructive of life and property on both sides, but the boundary between America and what would become Ontario was maintained. An uneasy peace was established for the next half century and settlement of diverse groups of people continued on the west side of the Niagara River, including First Nations, people of mixed Indigenous and European decent, British settlers (largely colonists from the United States), African Americans (free and enslaved) and German-speaking Mennonites (often called Pennsylvania “Dutch”). The community of Drummondville was settled in 1800 near the future Lundy's Lane battlefield, with one of the earliest hotels built in 1822 on Portage Road overlooking the falls. Clifton was established in 1832 near the falls; and a third community, Elgin, grew up where the first bridge was built over the gorge in 1848. 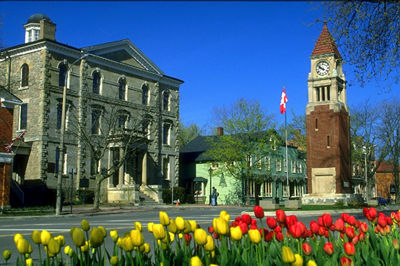 In 1856 the villages of Clifton and Elgin were incorporated as the town of Clifton, which became the town of Niagara Falls in 1881. Meanwhile in 1881, Drummondville became the village of Niagara Falls. This confusing situation ended in 1904 when the town and village of Niagara Falls were unified through incorporation as the city of Niagara Falls (pop. 7,000). The Township of Stamford joined the city in 1963; and in 1970, under regional government (Regional Municipality of Niagara) the village of Chippawa, and portions of Willoughby and Crowland townships also became part of the larger city. Between 1905 and 1906, three large-scale hydroelectric plants began operations. The development of the power resource moved to the edge of the Niagara Escarpment at Queenston Heights when the Sir Adam Beck No. 1 Power Generating Station opened in 1921. Its ultimate capacity of 373 MW (now 498 MW) was enhanced enormously when the Sir Adam Beck No. 2 Power Generating Station opened in 1954. These downstream power developments required massive diversions of water — from above the falls through a canal in deep cuts and two tunnels under the city, as well as the reversal of flow in the Welland River — to feed the reservoirs above the Sir Adam Beck power stations in the gorge below. In 2004, the Ontario government announced the building of a third tunnel and power project under the city to the Sir Adam Beck power stations. Completed in 2013, the Niagara tunnel project resulted in an additional 1.6 terawatt-hours of electricity, raising output at the Sir Adam Beck stations by approximately 14 per cent. The parkland area is adjacent to the falls (Corel Professional Photos). Tourists bustle on Lundy's Lane with the Clifton Hill Skywheel in background, Niagara Falls, ON in August 2008. 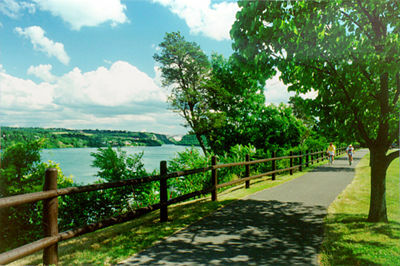 The trail runs some 56 km parallel to the Niagara River from Fort Erie to Fort George (courtesy The Niagara Parks Commission). In 1885 the Ontario provincial government established the Niagara Parks Commission, and the orderly, landscaped quality of Queen Victoria Park gradually replaced the jumbled carnival atmosphere and the disrupted landscape around the power projects that had prevailed previously at the falls. Extending steadily along the river precincts to the north and south, the initial 62 hectares (ha) at the falls was extended to Fort Erie by 1915 and, delayed by the First World War, reached Niagara-on-the-Lake by 1931. The Niagara Parkway system has expanded to a continuous extent of designed open space and various tourist facilities covering over 1,325 ha between lakes Erie and Ontario. Canadian Horseshoe Falls and falls view area, Niagara Falls, Ontario (courtesy Niagara Parks Commission). City of Niagara Falls, Ont (Corel Professional Photos). The falls became known in Europe and the United States through the paintings and writings of its many 19th-century visitors, but full-scale development of tourism ballooned only after the 1920s as automobile traffic steadily displaced the railway for incoming visitors. Drastic changes to urban form resulted: the railway-oriented downtown area declined; the tourist-commercial area of Clifton Hill closer to the falls grew; a line of hotels and motels expanded along the Lundy's Lane–Highway 20 route to become probably the longest of such strips anywhere in the world; scenic towers, high-rise hotels and tourist attractions ringed the falls; the Queen Elizabeth Way (QEW), with heavy traffic volumes from the urbanized area of southern Ontario and from the United States via the Peace Bridge, skirted the city to the west; Highway 420 fed from the QEW into the falls, where it crossed the Rainbow Bridge to link with the American Interstate highway system; McLeod Road became a subsidiary route to the falls from the QEW through residential areas to serve Marineland. The Niagara Square shopping mall (1977) and two casinos (opened in 1996 and 2004) placed further severe pressures on the original downtown locality. However, in the mid-2000s there was considerable public infrastructure and private property improvements to turn around the fortunes of the downtown. The City of Niagara Falls is an amalgamation of a number of villages (Drummondville, Elgin and Clifton), the surrounding township of Stamford, and, more recently, the village of Chippawa and parts of Willoughby and Crowland townships. These various communities, as well as post-war urban sprawl and tourist centres of Clifton Hill and Fallsview, together have resulted in a diverse city. The late 19th century development of hydroelectric power and heavy industries made Niagara Falls attractive to new immigrant groups especially from eastern and southern Europe. The Italian community in particular plays an important part in the life of the city and an informal “Little Italy” still exists. Indeed, according to the 2016 census, those citing Italian ethnic origins make up 19.2 per cent of the city’s population. The other two most commonly cited ethnic origins are Canadian (26.8 per cent) and English (25.8 per cent). Visible minorities account for 13 per cent of city residents, with South Asian, Filipino and Black people making up the largest communities within this group. Tourism and service activities predominate. 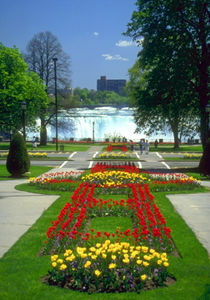 The city's largest employers are the Niagara Parks Commission, Casino Niagara (1996) and Niagara Fallsview Casino Resort (2004). The internationalization of the tourist economy has led to the upgrading of numerous service facilities, including the motel-commercial strip of Ferry Street and Lundy's Lane, and new major chain hotels overlooking the falls. In addition, the Niagara Parks Commission has also had improvements, including upgraded golf courses and the promotion of Niagara Falls as an international golfing destination. Attempts to build commercial attractions, such as a cable car adjacent to the Niagara Gorge area, are considered intrusive and have so far been defeated. The removal of an abandoned rail line through the city (for the building of Niagara Fallsview Casino), was an event welcomed by most citizens. The track that remains is the Canadian National Railway's main line through the downtown and the lines of the Canadian Pacific Railway and the Norfolk Southern Corp around the city. In addition to the falls themselves and the two casinos, Marineland is also a popular tourist attraction. Developed by a single entrepreneur in the 1960s, Marineland features an aquarium with a killer whale and other sea mammals as well as an amusement park. Keeping such mammals in captivity has recently resulted in protests by animal rights organizations and accusations of undue cruelty. The manufacturing sector is a mere shadow of its former self, but includes some food and beverages, transportation equipment, chemicals and chemical products, and fabricated metal products. The first bridge was built across the Niagara Gorge in 1848, and in 1853 the Great Western Railway arrived, establishing a railhead where the Niagara Suspension Bridge crossed the Niagara River. The Niagara Cantilever Bridge opened immediately to the south in 1883 for the Canada Southern-Michigan Central Railways. In 1897, the Niagara Railway Arch Bridge was built under, and into, the suspension bridge to replace its predecessor. These bridges, as great feats of engineering, along with the scenic attractions of the river at the falls and the beginning of rail passenger excursions in 1878, brought thousands of tourist visitors to Niagara Falls. Until 1950, there were steamboat services in summer bringing tourists across Lake Ontario from Toronto to St. Catharines	and Niagara-on-the-Lake with railway connections to Niagara Falls. A circular streetcar route (called the Great Gorge Route) was developed from 1893 to 1899 to take tourists from a suspension bridge at Queenston-Lewiston, up the Niagara Escarpment	and alongside the Niagara Gorge on the Canadian side of the river to the former Honeymoon Bridge. After crossing to the American side of the river, the line descended the gorge to run alongside the river to the Queenston-Lewiston Bridge. The advent of the car, as well as numerous rock-falls interrupting service, resulted in the line closing in 1932. In the 1920s and 1930s car and truck transport increasingly eclipsed rail transport, leading to the opening of Canada's first four-lane highway, the Queen Elizabeth Way between Toronto and Niagara Falls in 1939. While considerable freight transport remains today, the only passenger rail service is the daily VIA Rail/Amtrak service between Toronto and Niagara Falls. On summer weekends there is a GO (Government of Ontario) service between Niagara Falls and Toronto; and there is extensive lobbying for a regular GO daily commuter train service between the two cities to replace the GO bus/train service via the Burlington GO station . From 1846 to 2012, the Maid of the Mist tourist boat carried visitors past the American Falls to the base of the Horseshoe Falls. Following the introduction of competitive bidding in 2012, the Canadian service was awarded by the Niagara Parks Commission to Hornblower Niagara Cruises. A partnership between the City of Niagara Falls and the Niagara Parks Commission runs the WEGO bus service along the Niagara Parkway from Chippawa to Niagara-on-the-Lake with stops at the various tourist attractions. Niagara Falls’ daily newspaper is the Niagara Falls Review, and it has two radio stations. 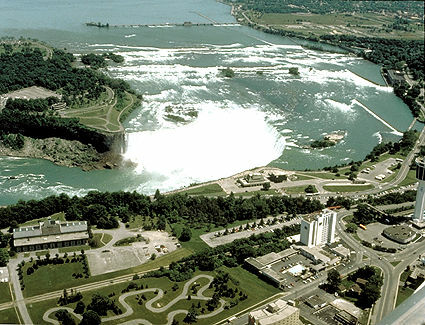 In 1970 Niagara Falls became one of 12 lower-tier authorities within the Regional Municipality of Niagara. The mayor and three councillors serve on the 30-person, upper-tier, regional authority. They are elected at large, meaning that the whole municipality votes for them, as opposed to each councillor representing a different portion of the city. The mayor and eight different councillors (also elected at large) serve on city council. Local government services are divided between lower- and upper-tier authorities; although in the Niagara Falls’ case, tourism services are largely provided by the private sector or the provincially-appointed Niagara Parks Commission. 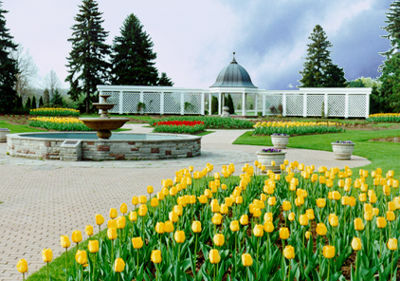 Attractions in Niagara Falls are plentiful, including the Niagara Parks Butterfly Conservatory (1996) to the north on the grounds of the Niagara Parks Botanical Gardens. The Rainbow Bridge (1941) replaced the Honeymoon Bridge, at the time the longest hinge-less bridge in the world, which collapsed in 1938. The adjacent Rainbow Gardens were landscaped at the same time. In the early 1930s, Sir Harry Oakes bought the two largest hotels in the region and, in exchange for land on the crest of the hill above Dufferin Island, the former hotel sites were donated to the Niagara Parks Commission. Oakes Garden Theatre, with its formal landscapes, terraces and amphitheatre, opened in 1937. Oak Hall, now set within the grounds of a nine-hole golf course, has been remodelled as the administrative headquarters for the Niagara Parks Commission. The Niagara Fallsview Casino Resort includes a 1,500-seat theatre, attracting a year-round roster of famous international stars. In 2011, the 288,000 square foot Scotiabank Convention Centre was opened in the Fallsview Tourist District. It includes an exhibition hall, ballroom, meeting space and a 1,000-seat theatre, and is designed to attract national and international conferences and trade shows, and extend the traditional May–September tourist season. 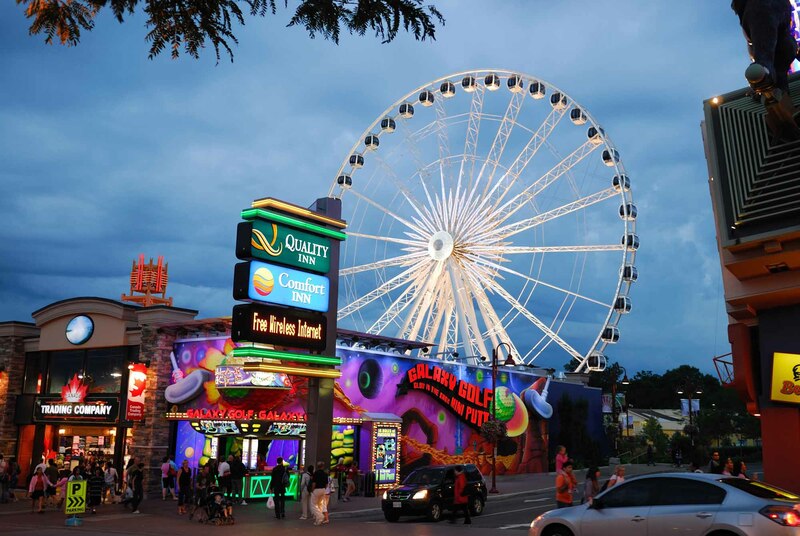 While public and private investment in the tourist economy of Niagara Falls over the last 20 years has been enormous, the city remains a largely summer-season, working-class, family-oriented, carnival-like resort destination. The two casinos now face competition from a casino across the river in Niagara Falls, NY, and another is being proposed for the Greater Toronto area. Also, increased border security since 9/11 and the need for passports during cross-border visits have made Canada less attractive to American tourists. Karen Dubinsky, The Second Greatest Disappointment: Honeymooning and Tourism at Niagara Falls (1999); Hugh J. Gayler, ed., Niagara's Changing Landscapes (1994); John N. Jackson, The Mighty Niagara: One River-Two Frontiers (2003); Patrick V. McGreevy, Imagining Niagara: The Meaning and Making of Niagara Falls (1994); George A. Seibel, ed., Niagara Falls Canada (1967); George A. Seibel, Ontario's Niagara Parks: A History (1985). War of 1812The official website of the bicentennial of the War of 1812 includes a history of the war, as well as a listed of associated historic parks, monuments and museums. Niagara FallsCheck out the website for the City of Niagara Falls, Ontario. Niagara Falls History MuseumFind information on the history of Niagara Falls and the surrounding area, as well as information on visiting the Museum itself.